Easy healthy dinners make life better! Portuguese roast chicken recipe! There’s a reason why every single one of our dinner recipes are easy. Easy just like this delish Portuguese roast chicken recipe! It’s because we’d prefer to spend less time in the kitchen. Yes, we have a business that started as a recipe blog and it’s still a huge part of what we do every day BUT we actually don’t like spending hours in the kitchen. We know… *GASP*. Easy dinner recipes make life better. The less time you gotta spend in the kitchen after a day of work, whether that be at home, in the office, looking after kids etc. the better we say! We also vote for less stuff to wash up and this is why we are in love with this Portuguese roast chicken recipe. It’s got that one pan thing going for it. Less big heavy stuff to wash up calls for a little happy dance right now. This recipe is part of our next live Get Merry Challenge! We are the most excited about this challenge than we’ve ever been because we’re changing it up a little. It’s going to be 21 days of delicious, healthy, EASY recipes just like this one. We’re going to be running daily discussions in the private Facebook group and of course, we have a whole bunch of health and happiness experts contributing. One of the most favourite parts of our Get Merry Challenges are the expert sessions. Usually, we do this via an interview system, you have to log in somewhere, you have to register and then you pray to the internet gods that it all works. We’ll be honest, it’s been the most confusing and frustrating parts of our Challenges. Coz sometimes technical #fails happen. This time we’re arranging our epic experts to do live presentations direct to the private Facebook group. You won’t need to log into anywhere, you don’t need to register to make sure you get the recording sent to you. All you have to do is be on Facebook! They will present on their topic, then you have direct access for Q+A. Yep, you’ll be able to get your questions answered then and there! This also means we don’t have to arrange the interview software system so it directly impacts the cost! BOOM! 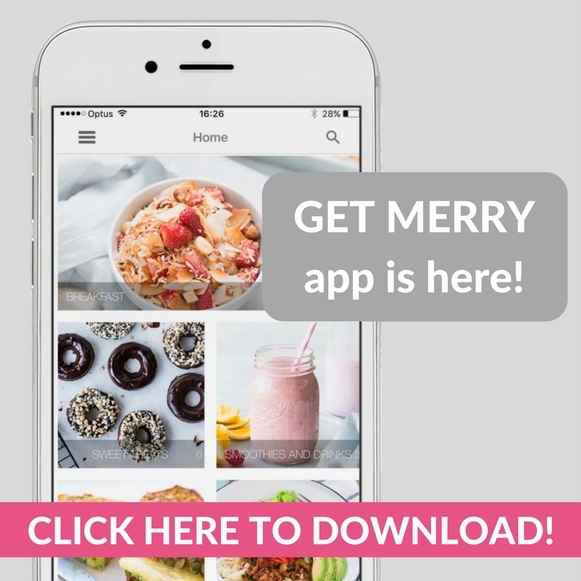 It’s going to be the most valuable Get Merry Challenge… ever! We are actually so excited, can not even explain it in this blog post (haha). AHHH! We’d love you to sign up to the wait list HERE. This means you’ll be the first to know about everything including the early bird rate and special gift! Bring on a 21-day burst of inspiration and motivation to create and live the happiest, most healthiest and Merriest life possible! 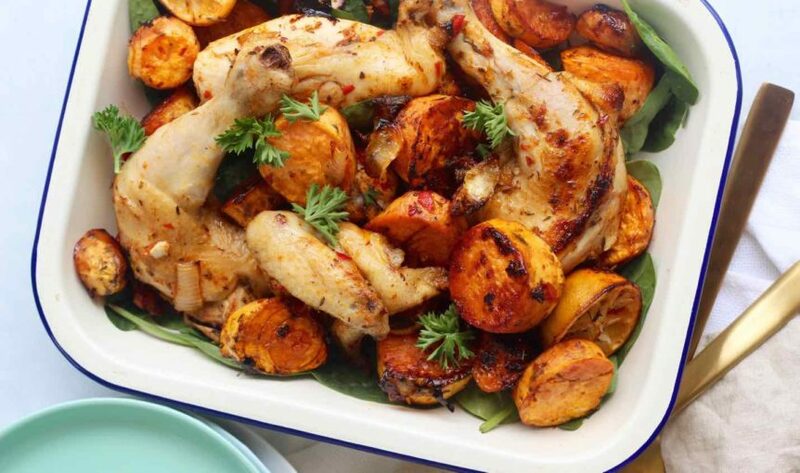 Now, go and enjoy this delish and super easy Portuguese roast chicken for dinner! P.s if you didn’t read the above, this recipe is part of our Get Merry Challenge. Don’t miss the early bird rate and special gift. 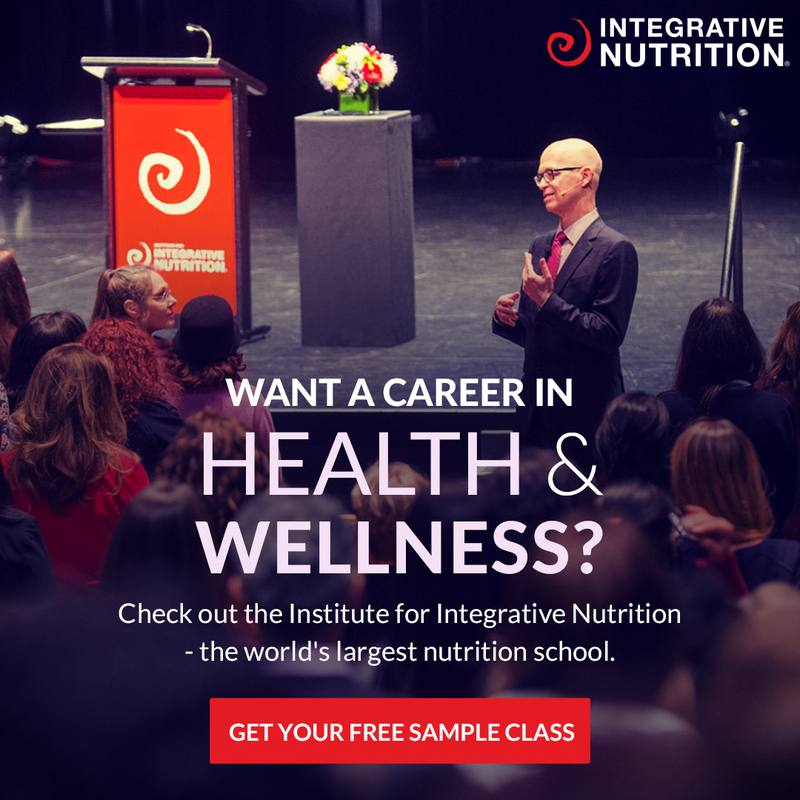 Sign up to the waitlist today! Place the chicken pieces into a large roasting pan. In a small bowl add all the marinade ingredients and mix well. Season well with salt and pepper. Pour the marinade over the chicken, turning the chicken to make sure each piece is completely covered. Place the sweet potato and onion in the pan, around the chicken, drizzle with a little extra macadamia oil and season everything again with a little salt and pepper. Place into the oven for about 40 minutes, check, turn if required and place back into the oven for about 5-10 minutes or until cooked to your liking. Serve with fresh baby spinach and... YUM! Don’t wanna cut the chicken? Ask your butcher! Or cook the chicken whole but it will take longer to cook, about 1 to 1 ½ hours.